Being able to provide context around individual messages is essential to understanding your organization’s larger social strategy. From categorizing outgoing content to organizing incoming messages, tagging helps you connect the dots when it comes to managing your team’s workflow, aligning your marketing strategies and meeting your overall business objectives. 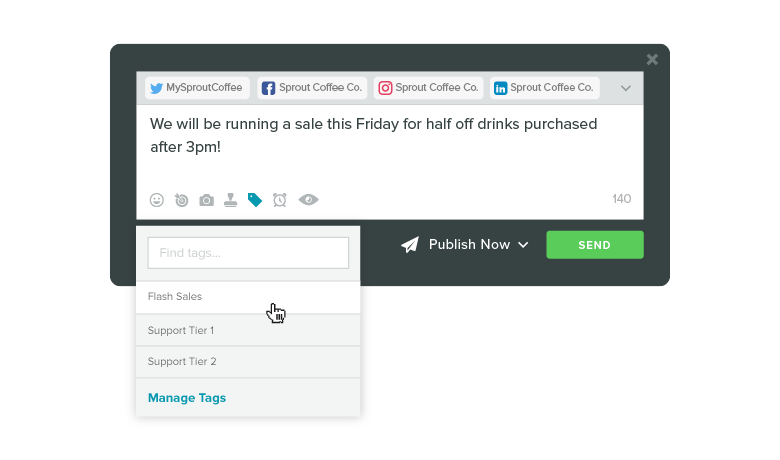 Today, we’re pleased to offer a new set of powerful tools to create, manage and apply message tags in Sprout Social. 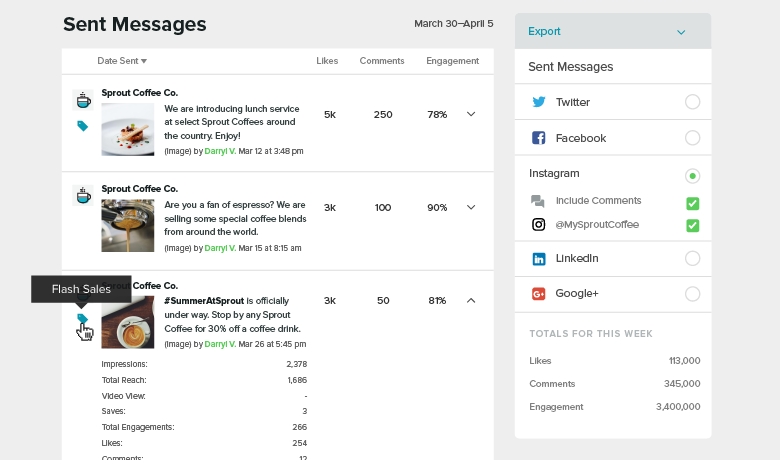 With this feature set, available in Professional and Advanced plans, your team can manage content campaigns more easily from Compose and collaborate more effectively in the Smart Inbox, Sprout’s centralized message management stream. An effective social publishing strategy is multifaceted. The right mix of content will cover various brand-relevant topics, consider target audiences and serve clear objectives (promotional, thought leadership, brand or community building). Tagging your outgoing posts will help you keep track of, and more effectively measure, your publishing efforts. 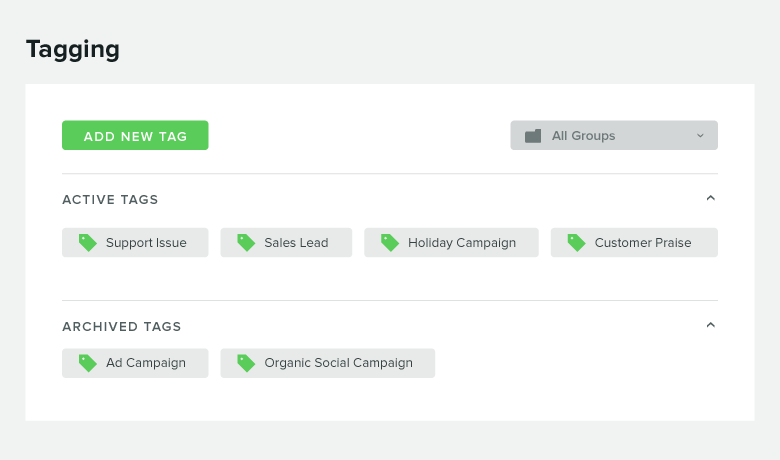 With Sprout’s new tagging toolset, you can easily organize and track marketing campaigns, content types and publishing strategies by applying a custom tag to any scheduled, queued or drafted message from Compose. Ensure a healthy mix of content by categorizing posts based on content type. Organize and track the success of marketing campaigns or publishing themes. Understand how content is resonating with target audiences. Make informed decisions by grouping content and analyzing aggregate performance based on topic, campaign, target audience and more. In addition to tagging from Compose, the Sent Messages report tag detail will help you track publishing goals and audience engagement. Tags can be viewed on individual posts with the in-app report, while the accompanying CSV download enables you to quickly sort, filter and aggregate metrics based on tags. As more people turn to social to communicate with brands, businesses are seeing an increase in incoming social messages. An organized social inbox and clear division of labor therefore are essential to executing a successful engagement strategy as a team. Whether your focus is on customer care or monitoring activity around social campaigns, tagging streamlines your message management and facilitates seamless team collaboration within the Smart Inbox. Customizable tags can be applied to messages as soon as they appear in the Smart Inbox. By applying tags that organize messages based on workflow, business need or internal structure, your team can operate more efficiently and effectively. Organize and track messages pertaining to campaigns, events and branded hashtags. Align your support processes and empower agents to operate efficiently. Share responsibilities and seamlessly collaborate with an agency- or client-side team. Categorize feedback and/or sentiment around a product, service or initiative. 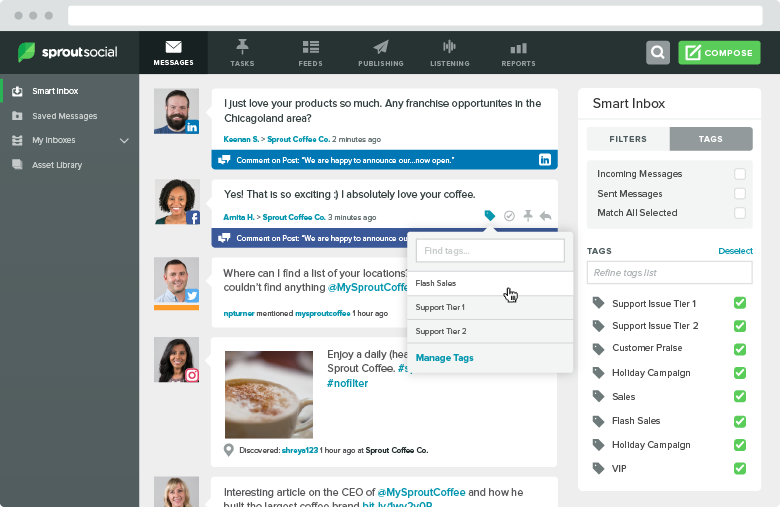 Divvy up messages based on your team’s structure to respond more promptly. With a tagging strategy in place, it’s important to have an easy way to find and sort your messages. The new Tags view in the right bar of the Smart Inbox can be leveraged to perform powerful message filtering based on one or multiple tags. Checking the boxes for Incoming and Sent Messages enables you to refine your filtering to focus on inbound or outbound strategies. The new Tags view brings even more flexibility to the Smart Inbox, helping departments work together to meet a variety of use cases and workflows. 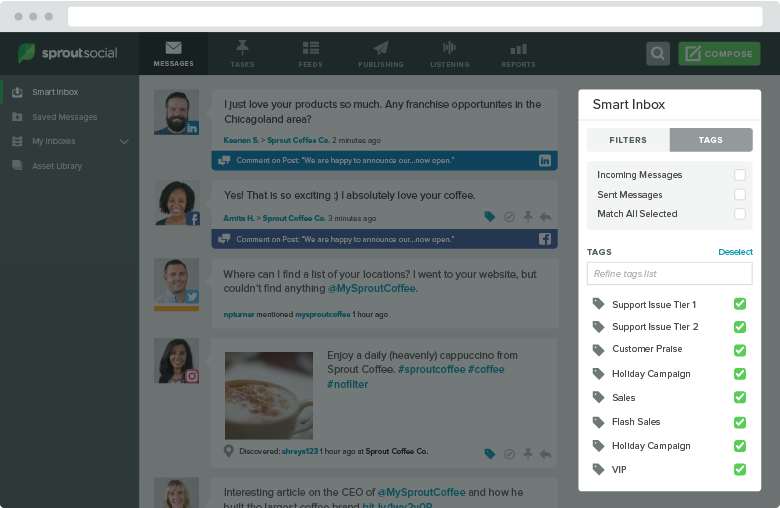 From end to end, tagging from Compose and in the Smart Inbox fits seamlessly into Sprout’s existing features. By leveraging Sprout’s flexible user permissions and intuitive group structure, we’ve made it incredibly easy to govern your team’s tagging workflow. 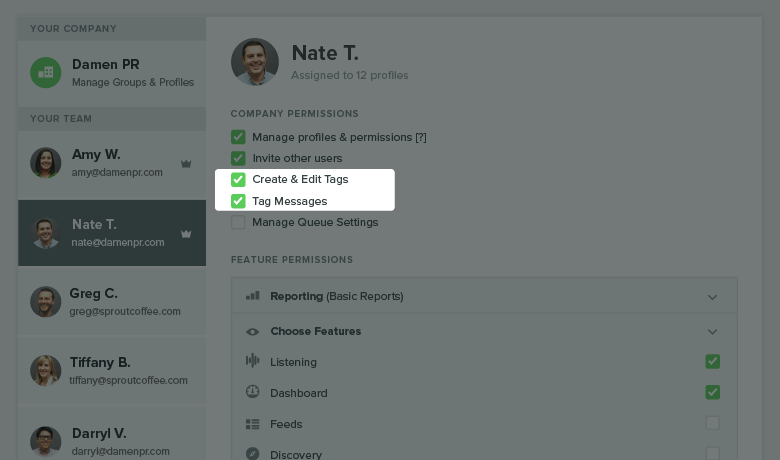 User permissions let you control who can apply tags and where those tags can be used. Once applied, these tags are visible to all users. This simplifies the tag management process, enabling you to fit the system to your team’s unique workflow. Tag management: The Create & Edit Tags permission (new!) enables a user to create, edit, delete, archive and unarchive tags. Smart Inbox: The Tag Messages permission (new!) enables a user to apply tags to messages in the Smart Inbox. Compose: Users with Publish or Needs Approval permission can apply tags to scheduled, queued or drafted messages from Compose. As always, user permissions can be set in the Users & Social Profiles screen under Settings. Users with the Create & Edit Tags permission can add and manage tags from the new Tagging screen under Settings. These users can also archive tags that are no longer pertinent and then unarchive them when they become relevant again. Archiving tags enables you to streamline the list of available tags without sacrificing historical data and tag attribution. The availability of each tag is fully customizable. When creating and managing tags, you can make them available to all users or just to specific groups. With this release, teams of all sizes and agencies managing multiple brands are able to use tags within their day-to-day workflow to gain a better understanding of their Incoming and Sent messages. As always, let us know if you have feedback.